This post can be found at The Coaches Toolbox, a collection of resources for coaches of all sports. Q: Why do you find it necessary to add the role of Leadership Educator to the practice of coaching? Aren’t coaches already modeling leadership for their student-athletes? “Now,” I continued, “are you a world-class leader?” Again, he looked at me with a humble smile. I asked his staff for a thumbs up or thumbs down vote of agreement. All thumbs were pointed upward. “Check that box too” I announced. “Okay,” I said as I headed towards my home territory. “Are you a world-class leadership educator?” The grin on his face slipped into a look of bewilderment. “Well,” I said cunningly, “if you’re a world-class coach and a world-class leader shouldn’t you be a world-class leadership educator?” Puzzled and disoriented, the brand name world-class coach didn’t quite know how to respond. I continued, “How do you go about developing team leaders—or in my world team leadership?” After uttering something he asked me to explain to him just what leadership education is and how one goes about becoming a leadership educator. A leadership educator is no different than, let’s say, a professor of management—someone who teaches management. A leadership educator teaches leadership. However, this role seems a little strange for many coaches. Few engage in a planned program and curriculum with the deliberate intention to build team leaders. Rather, most simply leave it to the seemingly natural growth of the individual. Oh, let’s not forget that a rigorous development program can be time consuming and emotionally demanding. “Coach,” I said, “we can’t check that box can we?” I then began to teach: “The role of leadership educator requires a different mindset, skill set and involves very different actions from the one’s you’ve been practicing for a lifetime.” The coach quickly acknowledged that a huge gap exists between what he and his coaching staff are doing and what they could do to develop team leaders. He then asked if I would work with him and his staff to develop their knowledge, skills, and abilities to be high-performing leadership educators. A: First, there’s a big difference between welfare and well-being. When everyone gets a trophy it’s often like a government handout—it’s freely given, no strings attached (and just as likely not to have been well-thought through as it does have extraordinary potential as a long-term positive of participation if done right). However, when a coach is concerned for the total well-being of her student-athletes, she is delighted to have everyone on the team maximize the experience; which includes learning how to lead. In a recent workshop a coach asked me if the idea of a leader in every locker is like a trophy for everyone. I held back, but then I injected my research and organizational framework into my response. I let the coach know emphatically, it’s just the opposite. I had to first help the coach see beyond her flawed mental model of leaders are born, the driving factor behind such thinking. The notion of a born leader appeals to our belief in intelligence, charisma, and other personal traits as attributes necessary for leadership. Most of us have been taught since childhood, at least implicitly, that we are either a leader or a follower—mostly followers as we can only have one class president. This plays on an almost universal theme that some people must be given the role of telling us what to do; it fits with our sensibilities that we are better off by granting some people power and agency. To be sure, my experience—countless number of workshops plus working alongside coaches—is that in most cases coaches are cynics when it comes to the idea that everyone has the ability to lead (though anticipating the critique of this claim I’m compelled to ensure I don’t imply all are equally motivated to learn to lead). For those of us who do not want to simply dismiss people as not capable of learning to lead—especially those who’ve had few role models in their lives—the concept of leadership development is a significant step forward. The idea that leaders are extraordinary people with special gifts is an assumption many coaches have embedded in their minds—baked into the cake. 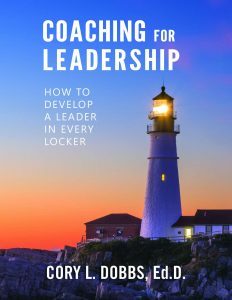 Most coaches operate from a paradigm—a set of assumptions about how the world works—that makes it difficult to understand why the virtues of a leader in every locker far exceed the verifiable inefficiencies of the team captain model. What I’m advocating is this: when a coach assumes the role of leadership educator, it is to teach leadership to all his or her student-athletes. Why in the world would you not want to teach leadership to all of your players? And why in the world would you not want your players to develop a leadership mindset, skill set, and act like a leader? Beginning with the end in mind, when you deploy a leadership learning system you are creating a learning organization. When coaches honor the need to personalize learning for each student-athlete, they then create a dynamic learning environment in which everyone is learning in action and by reflection. However, if a coach doesn’t think it’s worth his or her time, then it’s likely they are acting from what Stanford professor Carol Dweck calls a “fixed mindset.” A coach that acts from this perspective will do little to stimulate interest and commitment to personal leadership development of the student-athlete. Such a mindset places little value in teaching leadership. After all, they reason, either the athlete is a “natural” leader gifted with the “right stuff” or they’re not. This thinking suggests only a few athletes on any team are capable of leading. Such thinking makes no sense. Leadership is not an all-or-nothing ability, something you either have or don’t have. As a form of social interaction, leadership can be developed when student-athletes and coaches put in effort, time, and practice. The reality is the student-athlete (and the coach too!) has to work hard to learn how to lead, to develop a set of skills and competencies that will serve as a foundation for lifelong learning of leadership and team building. Leadership can be learned, indeed it must be learned. The key is that it must be practiced in order to facilitate the growth and development of the student-athlete. Without practice, which requires time, effort, and energy, all you have is a potential leader. Finally, in my Coach’s Guidebook: A Leader in Every Locker I make clear that most student-athletes are raised in sport to simply follow the lead of the coach; thereby making the participant a passive recipient of leadership. After years of going along to get along the young athlete develops the habit of passive followership. This is one of the biggest challenges of change we face as leadership educators. Should everyone get a trophy? Probably not (save for another day the issue of participation and achievement). Should everyone get an opportunity to learn about leadership and explore how to lead? Yes! And to do so requires great effort on the part of the student-athlete. The athlete is not given anything but opportunity. Are all leaders equal? No! Everyone has a different starting line, but all student-athletes can learn to lead at some level. A: I do this because every act of coaching rests on assumptions, generalizations, and get this—hypotheses. That is, the coach’s mindset determines to a great extent how he operates. It is very unlikely that a coach will change his or her ways of coaching until they look in the mirror and consider who they are and what they believe and why they believe what they believe. Once they peel away the layers and recognize how deeply held beliefs and attitudes—such as only a few athletes are capable of leading—he or she can design a culture that maximizes the experience for everyone. It’s a shame that many coaches are intimidated by the idea that embedded within every player is a potential leader. There is great suspicion of how things will work if everyone is potentially a leader. A common concern about a leader in every locker came up one day when I was talking with a group of coaches. “How can you ask us to have all our student-athletes lead?” one coach said to me. “Isn’t that opening Pandora ’s Box?” Recall that when Pandora’s Box was opened, all the troubles of humanity flew out. Is this how coaches imagine what might happen should everyone learn to lead and be given opportunities to lead? I understand their concern. They really have no reference point to relate the practice of teaching everyone leadership. But when coaches and players learn for example, the 5 Steps of Team Leadership, the 8 Roles of Team Leadership, and The Coach as a Leadership Educator that I’ve created it all begins to make sense. Something else we do is utilize a specialized vocabulary. In addition to the 5 Steps of Leadership our program includes specialized terminology and unique constructs such as the eight roles of team leadership, leadership educator, followership and leadership orientation, and leadershift to cite some of the vital elements of our way of talking, thinking, and developing leaders. The unnatural gap between the traditional team captain model and the reality that everyone can learn to lead at some level requires a monumental change program. It’s going to take awhile, but over time coaches will discover new things about how it all works together to the advantage of the program and the players. A former basketball coach, Cory’s coaching background includes experience at the NCAA DII, NJCAA, and high school levels of competition. While coaching, he researched and developed the transformative Becoming a Team Leader program for student-athletes. Cory has worked with professional athletes, collegiate athletic programs and high schools teaching leadership as a part of the sports experience and education process. Cory cut his teeth as a corporate leader with Fortune 500 member, The Dial Corp. As a consultant and trainer Dr. Dobbs has worked with such organizations as American Express, Honeywell, and Avnet. Visit www.corydobbs.com to read Cory’s leadership blog.